Welcome to the website of the Embassy of Georgia to The Kingdom of the Netherlands. Our website provides its visitors with the opportunity to get updated information about events taking place in Georgia and ongoing relationship between the Netherlands and Georgia. 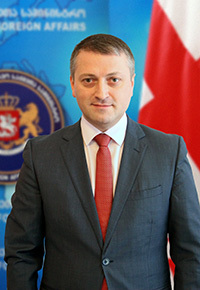 The Embassy of Georgia to the Netherlands has been functioning since 2007 and its primary goal has been deepening the friendly relations between our nations, promoting Georgia and protecting the rights of its citizens. At the same time, further strengthening of the existing relationship between the two countries in a number of important areas, such as politics, economics, culture, education, etc. is one of our main tasks. The Kingdom of the Netherlands, one of the leading states of the European Union, is a very important partner of Georgia, which has greatly contributed to the development process of the Georgian State since the very first day of restoration of its independence. And it is with the pride I would like to share with you that The Netherlands has been one of the biggest foreign investors in Georgia for the last consecutive years. We hope that you will find our website informative and it will help you to learn more about Georgia and the activities carried out by our Embassy in the Netherlands.